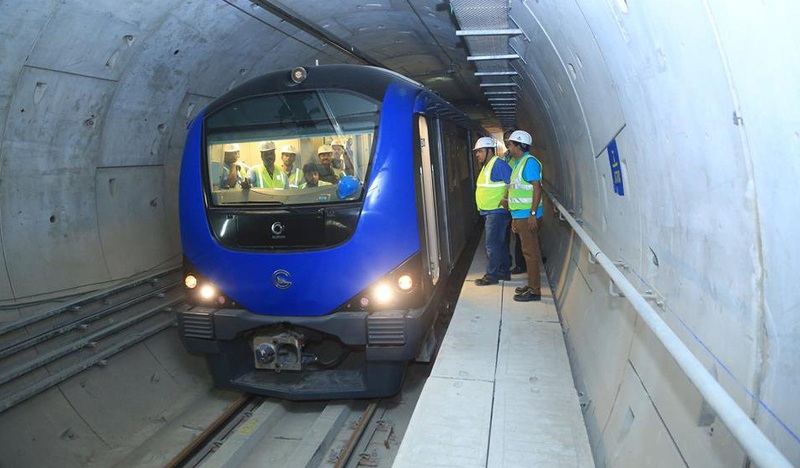 Chennai: The Chennai Metro Rail Limited (CMRL) started metro trial run in the underground line between Saidapet and AG-DMS stations on this Monday. During trial run, trains are operated back and forth to test the working of various systems of the train and the route. After opening of commercial run on this stretch, commuters can take a direct ride from AG-DMS station to the Chennai airport. This 4-km stretch from Saidapet station (located near Directorate of Medical and Rural Health Services, Teynampet) to AG-DMS station (located near Panagal Maaligai) covers four stations — Saidapet, Nandanam, Teynampet and AG-DMS. Sources said that the trial run was carried out only on downward track. While officials claim the other track (upward track) is also ready, it is not clear why the trial run was not carried out. Various systems including, tunnel ventilation, signalling, platform screen doors and automatic fare collection have been installed. Eight months ago, for the first time, Chennai Metro Rail tested a locomotive on this stretch. After completion of electrical and signalling work and integration of these systems, trial run with a train started on Monday. This exercise will continue till the operations begin on this stretch in May. Before this stretch is thrown open to public, one last inspection by Commissioner of Metro Rail Safety will be done in late April or early May and after they give their approval, the operations will start. According to CMRL official, construction of stations is almost completed. Work on this stretch faced a severe disruption three years ago. Gammon India and Russian firm Mosmetrostroy got a joint contract to carry out the work but the Russian firm walked out of the project owing to funds crunch and later Gammon India’s contract was terminated. Another contractor Afcons Infrastructure Limited took up this work.